Home > Symptoms > Celiac or Crohn's: What is the Difference? Recent developments in the diagnosis of Coeliac Disease (called Celiac Disease in the USA) have led to a remarkable change in the speed with which the disease can be recognised and an increase in the diagnosis rate, which has changed the way the condition is viewed. 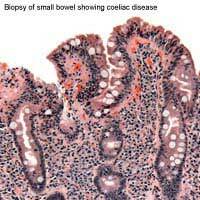 Until only a couple of years ago mild Coeliac Disease could easily be misdiagnosed or remain undiagnosed because the normal route to discovery was for severe symptoms to lead to an intestinal biopsy, while lower level symptoms were treated by different means and not examined via biopsy, so an accurate diagnosis was not made. The traditional route was to apply a Coeliac screening blood test – this measured Anti-Gliaden Antibodies (AGA) which are found when people eat gluten to which they are intolerant but AGAs disappear when the patient moves to a gluten-free diet. This test has been relatively successful, except that around 2% of sufferers will return a negative test result owing to complicating factors and an unspecificied percentage of the population, possibly including many with Crohn’s disease, produce a positive test without demonstrating Coeliac Disease symptoms. The new test, which measures tissue transglutaminase antibodies, is used to complement the blood test and diet change, because it can separate out the proportion of the population that has Coeliac Disease but produces a negative AGA test. GPs are being advised to review patients with unexplained and long term diarrhoea, anaemia, mouth ulcers, rashes and chronic fatigue because they may be Coelic Disease sufferers with mild symptoms. The test may also be offered to those who are being treated for another primary condition such as diabetes, thyroid disease, Downs syndrome or osteoporosis as these conditions are often seen alongside gluten intolerance. There is only one effective treatment for Coeliac Disease – complete and permanent avoidance of gluten. This means removal of wheat, rye and barley from the diet and may or may not include oats – some gluten intolerant people can eat them, some cannot. On the other hand, Crohn’s Disease, is an an autoimmune condition of the small bowel. It is commonly but not exclusively found in people aged 14 to 24 and the symptoms are often, but not always more severe than those seen in Coeliac Disease. Likely indicators are serious and chronic diarrhoea, unexplained high fevers, severe cramps, weight loss, bowel obstructions, vomiting and anorexia. A very common symptom in around 20% of sufferers is blood in the stools. Crohn’s Disease is treated with pharmaceuticals: a group of medicines called aminosalicylates are used to reduce mild inflammations, while corticosteroids are given for more serious flare-ups. There are medicines used to suppress the immune system which are given once steroid treatment has ceased, and antibiotics may also be given to reduce bacteria in the bowel and to treat abscesses. Because neither condition can be cured, and because milder symptoms in both can be similar, it is vital that correct diagnosis is made, as management of either condition can be very successful if the right treatment is applied. There is no dietary restriction for Crohn's disease: eating a balanced diet may help manage the condition, so excluding certain foods can actually make the patient’s symptoms worse. The 20% of Crohn’s sufferers who have had bowel blockages are often recommended to eat a diet that is lower than usual in fibre – this is the opposite of a gluten-free diet which may be much higher in dietary fibre than the average diet, and again, misdiagnosis can lead to increased suffering in a Crohn’s patient fed a Coeliac Disease diet.